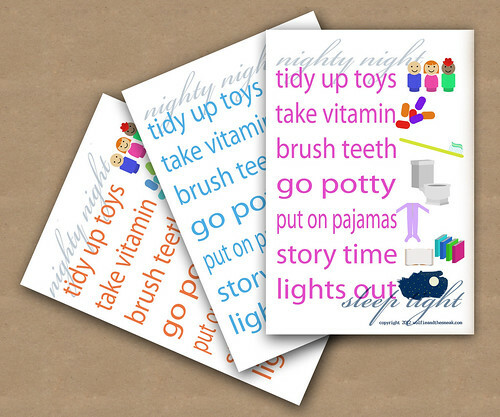 If you haven't checked out the shop in a bit, there is a new bedtime routine chart (in pink, teal, or orange) available for instant download. We've also changed the format of the hand turkey paper place mats. They're available as downloads, too, since shipping was so costly for a low-priced item. There are tons of responsibility and routine charts in the market. Many incredibly cute and well-designed, but none fit our bedtime routine. ** So I made this one and had it laminated at Kinkos. If you're interested, but not interested in printing it yourself, I'm going to add a print version to the shop as well. Another option? Get the download and send it to your local copy shop, where they can print it for you. **Dare I say our increasingly difficult bedtime routine (hello "threes") that needed a little more structure. Mabel thrives when she is given responsibility and a little more freedom to do things on her own. Obviously we're not giving her the car keys, she's three for crying out loud! But she likes to be treated more like her older cousins and less like a baby. That sort of attitude helped make potty training pretty much a breeze, for which we're eternally grateful.